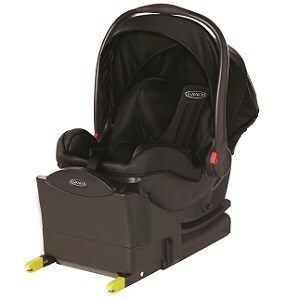 Graco Snugride i-Size is a good safety seat with Isofix base, on which the seat can easily and stably installed. However, if you want to secure it with seat belt, instead of isofix, make sure the belt is long enough for this seat as it needs a quite long strap. The i-Size approval means that you can use the carrier based on the baby’s size instead of weight. You only need to get your next seat when the baby’s head reached the upper edge of the seat. The Isofix base can be adjusted to seven positions to make enough leg room as your child grows. The size and height of the harness can easily be adapted to the child with a central adapter. The carrier can be used in i-Size approved cars and a list of cars in which the seat fits properly can be found on Graco’s homepage. It is equipped with deep side wings to provide extra safety in case of a side impact. The foam is made to absorb energy. A newborn body support together with a memory foam can be taken out later on, to make extra space for the growing child. There is also an impractical feature worth to be mentioned: the handling has to be folded when you want to install the seat in the car. I do not think it is a big deal but it is a bit different from most seats that you might take into consideration. Another advantage is, that the seat is equipped with the brand’s Click Connect Technology so that you can use it with all the Graco Click Connect pushchairs in a one-step safe attachment and convert the carrier into a Travel System. The cover can be removed and washed in washing machine. Do not use on passenger seats with activated front airbag to prevent serious injuries or even death! The carrier is only available in Midnight Black color. I hope you liked this review and if you have any question about the Graco Snugride i-Size seat + Base i-Size or want to leave your own personal experience, leave a comment below.